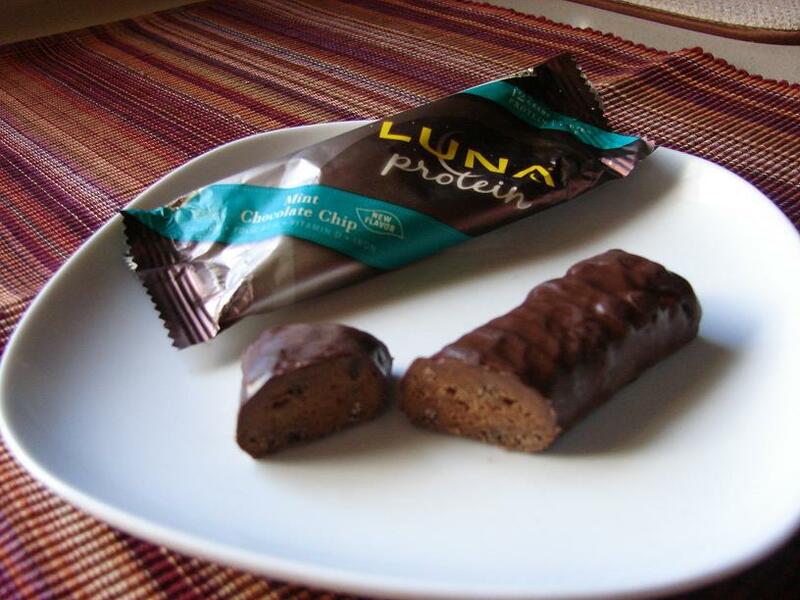 Last week I received a nice surprise – three of the new, gluten free LUNA Protein bars showed up in my mailbox. LUNA/Clif Bar was kind enough to send me the Mint Chocolate Chip, Chocolate Peanut Butter and Cookie Dough flavors to sample for you. There are two additional flavors, Chocolate and Chocolate Cherry Almond. Since we haven’t been hiking much over the past month due to fire restrictions, I haven’t had much of a need for protein bars. But I figured I should break into them and check them out. Just for you, of course. I was pleasantly surprised to find that they were chocolate covered! I love chocolate-covered anything. But it’s a good thing I didn’t wait to take them on a hike, they probably would have been a gooey, melty mess. For this reason they also probably won’t stash well in your purse or bag, although I may try it this week. Again, just for you. As you may know, most (all?) 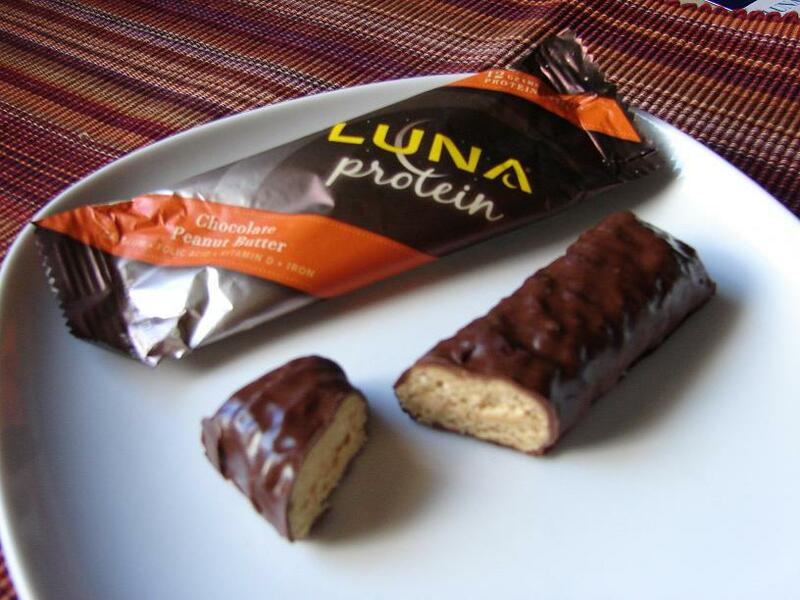 LUNA bars have not been gluten free in the past, but these new protein bars are gluten free (not all of the LUNA products are gluten free, check the labels). And I have to commend the folks at LUNA as they have tried to hit it all in these bars. 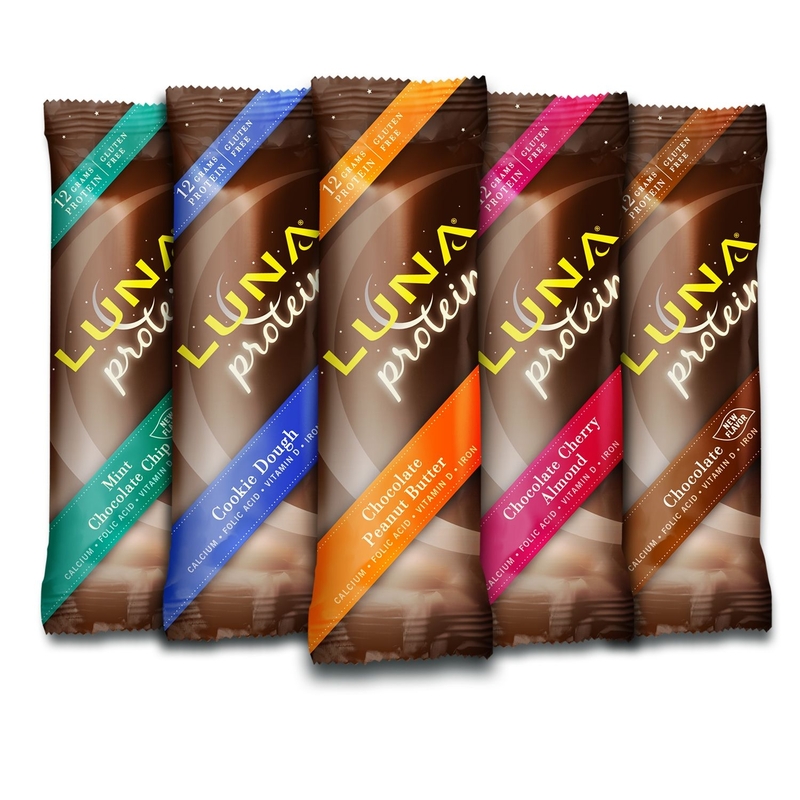 Each 1.6 oz (45g) LUNA Protein bar has around 180-190 calories with 12g protein and 3g fiber, along with essential nutrients women need. It is high in calcium and folic acid, and is a good source of vitamin D, iron, fiber and antioxidants (vitamins A, C and E). Each bar has 6-9g fat and 13-15g sugar depending on the flavor. That’s a heck of a lot of protein stuffed into a 180 or so calorie protein bar. Most bars only have a third to half that amount of protein. 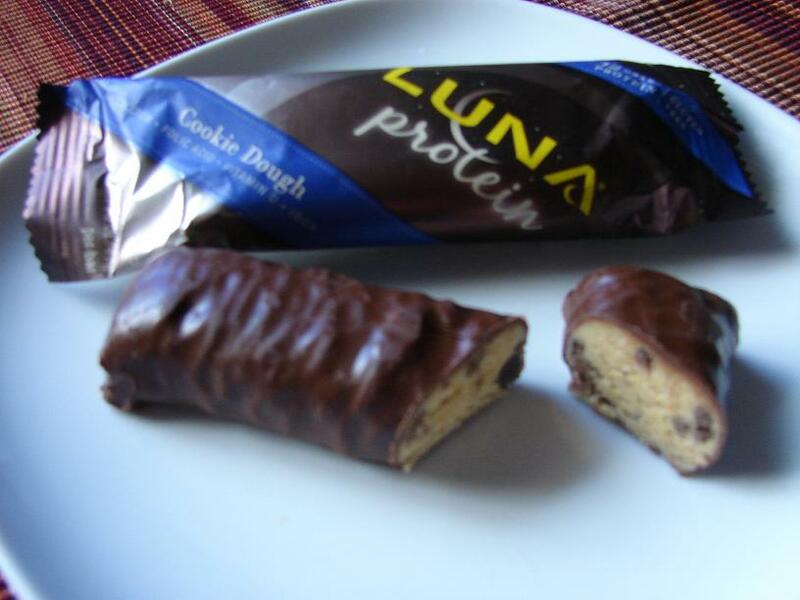 At the beginning of 2011 we started to transition all LUNA Protein flavors to be gluten free. To do this, Clif Bar & Company has looked at all aspects of making our bars. Our ingredient suppliers have confirmed that all ingredients are gluten free, so they contain no gluten from wheat, rye or barley. The location where we make our food is capable of making a gluten free food and we test our finished products to confirm that they are gluten free. Our newest flavors, Mint Chocolate Chip and Chocolate, are all labeled gluten free. In the absence of official FDA standards, we use the testing benchmark set forth by the Gluten Free Certification Organization (GFCO), which is less than 10 parts per million of gluten. So there it is, and as always only you can make the choice that’s right for you. Protein Blend (Soy Protein Isolate, Whey Protein Concentrate), Organic Evaporated Cane Juice, Coating (Organic Evaporated Cane Juice, Palm Kernel Oil, Cocoa, Soy Lecithin And Organic Vanilla Extract), Peanuts, Organic Peanut Butter, Vegetable Glycerin, Inulin (Chicory Extract), Natural Flavors, Soy Rice Crisp (Soy Protein Isolate, Rice Flour,), Salt, Soy Lecithin, Almonds. So, a lot of ‘processed’ ingredients. And it contains soy, dairy and nuts, so it isn’t for everyone. But, all in all, a good flavor, just enough peanut butter flavor to balance the outer chocolate coating. There are little crispy nuggets within the ‘nougat’ (as they call it) which gives a little texture to the filling. Bottom line: Pretty good. I would eat one again. Next up, the mint chocolate chip flavor. Again, this one is gluten free but contains soy, dairy and nuts. Bottom line: I wouldn’t eat the mint chocolate chip flavor again due to the strong mint flavor, it just wasn’t for me. Next up, the cookie dough flavor. So, again, they contain soy, dairy and nuts. Doesn’t the nougat filling in the above picture remind you of cookie dough? It does to me, although the flavor wasn’t quite there. I tasted a bit of an artificial flavor to the filling in this one but it wasn’t enough to turn me off. This one also has the addition of chocolate chips and the soy crisps to add texture. Bottom line: I liked this one well enough and would eat it again. Overall, I would eat the Cookie Dough and Chocolate Peanut flavors again but I am not sure I would buy them if I had other choices. And I might happen to pick up the Chocolate Cherry Almond flavor to try out if and when I see it. I like the chocolate-covered factor but it can also be a hindrance here in the heat of the southwest. I will let you know how they hold up to the heat and being stuffed in my purse for a couple of days. (That’s what I like about KIND and LARAbars, I can stick them in my purse or pack and not worry about them, they’ll be just fine until I need one.) But, I could see keeping these in my desk drawer for a quick, healthy and chocolatey(!) mid-afternoon snack to hold me until dinner. There’s enough fat in them to make me feel like I have eaten something substantial and added fiber to help keep me feeling full. I also like the quantities of calcium and B-12 in one bar as they are items I monitor for my own health. I haven’t seen them at my local stores yet, so keep your eyes open for them. Have you seen them in your area yet? A big thank you to LUNA/Clif for providing these for me to sample. I’m glad to have found your blog. Those bars look great – I’m definitely going to be looking for them in my area. Hope you get to start hiking again soon. I really liked the chocolate cherry, though I agree about the KIND & Lara bars. Also, Bakery on Main has some amazing new bars..True Bars. YUM!! Thanks for this review. I was wondering which ones to try since someone mentioned them recently. Good to know they are just so, I may try the cherry almond one.